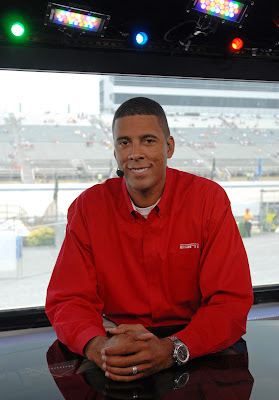 Just when we thought the silly season was limited to drivers, it was ESPN's own Brad Daugherty who announced he was going to be joining the ranks of Sprint Cup Series owners. Appearing on the Tuesday edition of NASCAR Now, host Ryan Burr introduced Daugherty and his 2009 Sprint Cup driver Marcos Ambrose. Daugherty has partnered with the JTG team to create a new racing entity that will campaign in the Sprint Cup Series full-time next season. Burr spoke with Ambrose and Daugherty and touched on all the points of the deal. Originally, Daugherty was rumored to be entering the Craftsman Truck Series. Now, the news has come that JTG-Daugherty racing will be moving up to the big time. Starting as a single car team, it should be interesting to see how Daugherty progresses. Burr did a good job of pinning Daugherty down on exactly why he got into a situation like this. Daugherty was not shy in mentioning that it was ESPN and his exposure that helped to keep his NASCAR profile high and enable this type of deal. Burr turned to Andy Petree to ask about what being an owner will bring to Daugherty at ESPN. "Credibility" was the response. Petree is not one to mince words and as a former owner Petree could speak to the subject. As for Ambrose, Petree said there is going to be a pretty steep learning curve for the Aussie. It was a diplomatic response, but it seemed that Petree was a bit surprised that Ambrose had come along as a part of the deal. Perhaps, fans will remember that thought for next season. Burr continued the show with a good interview with media-friendly Joey Logano. Still very young in many ways, it is nice to see a fresh face being promoted as the future of the sport. Burr tried to ask his sophisticated and news-oriented questions, but ultimately Logano is a teenager and this adult approach did not work. The entire purpose of Logano being on the show was Burr having the ability to ask about the Home Depot car in 2009. "Do you think you are ready?" asked Burr. "I think I am ready," said Logano. It is times like this that the naive side of the NASCAR Now crew comes out. Every driver is ready for the opportunity of a lifetime. It was nice of ESPN to give a slot to the Kyle Petty charity motorcycle ride. Even nicer was to hear the mellow voice of Harry Gant calling-in by phone from the tour stop in Lexington, KY. Gant showed once again the "old school" NASCAR style that is sorely missed in the sport today. There is no doubt that once the Daugherty news gets a bit older reaction will begin. Along with Ray Evernham and Rusty Wallace, ESPN now has three active owners with teams in either the Sprint Cup or Nationwide Series on staff. Whether he likes it or not, whatever Brad Daugherty says on-the-air from now on will be run through a very different "filter" by viewers. The Daly Planet welcomes comments from readers. Simply click on the COMMENTS button below and follow the easy instructions. The rules for posting are located on the right side of the main page. Thank you for taking the time to stop by. I guess this is a good move for Brad. I notice alot of people would ask what he adds to the NASCAR Broadcasts on ESPN. Well he is a Sprint Cup Owner now. So he will know whats going on in the sport more than most. Well, its just another in a long,long,long,long long line of starry eyed wanna be owners with no racing experience, hiring an inexperienced, wild eyed driver to try to eek out a space in big time racing. If names like Staubach and Aikman can't make a go of it, Daugherty has less of a shot than the Pope touring thru Baghdad. I for one am happy for Mr. Daugherty. He is a long time fan who, if everyone doesn't know this by now, has owned a NASCAR truck team. Who knows whether or not he will be successful, but I think he is a welcome addition to the garage. Mr. Daly, I would like to add a little perspective to your statement "It is times like this that the naive side of the NASCAR Now crew comes out. Every driver is ready for the opportunity of a lifetime." That is not entirely true. Brad Keselowski was on Wind Tunnel a few weeks ago and was asked if he was going to the Cup level. He stated flat out that he was not ready and wanted to wait a season. It's not unprecidented to legitimately ask a question like this and expect an honest answer. I do admit most drivers would say they are ready, however my feeling is that ESPN is setting up Lagono for next season. If he goes to Cup, and possibly fails, they can pull that video out and parade it in front of analysts while asking who made the stupid decision to push this kid too fast. Far from a wannabe, Brad had owned a truck team and a Nationwide team in the past, and has won race's with Robert Pressley and Kenny Irwin Jr. He's been there. Good luck to him. I agree. That piece of video will have a very long shelf life. It would be interesting if Brad K. had the #20 car staring him in the face. Even I might be ready for that challenge. I guess my question is this, hasn't Rusty said that his contract with ESPN prohibits him from owning a Cup team yet it's OK for Brad? My other thought was there goes the Wood Brothers sponser, I wonder of the 21 will even be back next year? That said I wish him all the luck he can find because it's not easy. Brad's past ownership of Trucks and Busch is like comparing a Tinker Toys bulder to a NYC skyscraper. Can ANYONE name a successful owner who has come from Trucks or Busch to a WINNING team in cup?? Other than Bill Davis, which has taken 15 years, I cannot. In light of ESPN's restriction on Rusty's ownership of a Cup team, is it clear that Brad will be back as an analyst for ESPN next year? I'm not sure whether Little Debbie is still a sponsor or associate sponsor for the Wood brothers - but, if they are, it would seem to be a curious situation since Ambrose drove the Wood brothers car at Sonoma this year. I'm a huge fan of Ambrose and he was the reason I watched Trucks last year and watch Nationwide this year. I hope they can give him a good enough car to show his stuff in Cup. Ambrose is very media and sponsor friendly and that may be part of the reason that Brad wants him, due to his own media experience. An ESPN spokesman has confirmed that there is no problem with the upcoming 2008 Sprint Cup season on ESPN and Daugherty's announcement. "If there's a conflict with a specific issue, we'll have other announcers deal with it," said ESPN's Mike Soltys. That should put any issue to rest until the off-season. By then perhaps ESPN will have formulated a new policy. Isn't it ironic that Marcos gets a full time Cup ride and poor Boris one or two races a year? I wonder what the dynamics will be when Boris and Brad are on NN. Simply owning a team doesn't make one qualified as an expert on antyhing but how to put your moeny into a team. Would you expect to get lots of racing insight from Teresa Earnhardt? I disagree. Owning a team gives you a lot more insight than one would think. Its just like any other business. If you are a machinist, you have a lot of knowledge about how to turn a hunk of metal into something useful. However, your view of the business is somewhat limited by your job. The owner, in contrast, has to know a little about everything. A more macro viewpoint if you will. Its good to have different viewpoints and perspectives. It provides a richer experience for the viewers. As for your comment about Ms. Earnhardt, you do know her maiden name is Houston and she is from around Hickory, NC. If you don't, you may want to read about her family. Like her or not, she probably has more inside information about racing than all of us combined. I am well aware of Teresa's racing background. Nevertheless, given her current state of involvement in Cup racing, which is far from hands-on, I contend she'd be less than informatve when it comes to telling us about racing today. You don't like that comparison? Okay. Then how useful do you think team owner Troy Aikman would be in the booth? Just having ther money to buy into a team doesn't make one an expert on racing. Who do they, brad daugherty and randy moss, think they're fooling? The ONLY reason that brad daugherty is involved in racing in any way is because he's black! He tried this stunt before and failed. Now that randy moss, with the help of daugherty, is getting involved, daugherty see's this as a chance to have more blacks in the sport. Apparently, he feels that blacks need to have their hands held and led into the sport. The fact that HE, daugherty, continues to use the words "minorities" and, god forbid, "african american", is PROOF that the only reason he is involved is because he's black. THAT is pathetic! The ONLY reason that brad daugherty is involved in racing in any way is because he's black! Do you have a source for this or is it your own opinion? As a longtime NASCAR fan, I applaud Brad Daugherty. gets the command to fire his engine. It's a deal like this that keeps me interested in NASCAR. My source? The fact that daugherty helped create the ridiculous notion of "diversity" in NASCAR. If certain groups of people are not smart enough to know that they can build a race team, or drive for a race team if they work hard at it, than those are people that NASCAR does not need. Just like everything else: Your in because of TALENT, NOT because the color of your skin! I hope you keep posting Ritchie. Your knowledge and perspective on racing and broadcasting is needed. I agree about the questions, I thought they were excellent, especially compared to some I hear on trackside. I think Brad's had interest in racing most of his life, so he must realize the odds are against him. I don't understand Randy Moss, good luck to him. Your particular brand of racism is not needed nor wanted on this board, nor in the sport. anon9:49: thank you. i agree with that sentiment. 3web88: please take that ugliness to some other board. My understanding is that JTG Motorsports is an offshoot of the Wood Brothers. I also believe that the Wood Brothers and JTG have made some sort of "split", but nevertheless they are still connected in some facet. The Marcos Ambrose connection is that Little Debbie wanted him to drive the car. It's a contractual deal. As far as Brad "getting involved" in the sport: Regardless of the reasons. be it a diversity issue, starry eyed,etc., He has been a fan alot longer than the diversity program has been around. He was a Richard Petty fan 30 years ago. I'm pretty sure the Confederate Flags are old news to him. Perhaps, folks, that he just wants to be involved in racing? Needling every point to death is counter-productive. Have you had an opportunity to take a look at Daugherty's NASCAR background and how he came to be asked to help with the original diversity effort? It seems that the reality of how those things came about and the depth of his background in racing is very different from the reasons you suggest for him participating. Since this is an off week for Cup, it would be a perfect time for NASCAR Now to look at the economic climate of NASCAR, since the NASCAR budgets are up for review at the automakers. GM confirmed this Tuesday. "There are some elements of motorsports that are very effective means of promotion and communication with certain customer segments. The ones that are less are the ones that will be ... scaled back," GM North America President Troy Clarke said at a news conference. "It will be gradual, by and large, because we have contractual relationships or support relationships that we'll begin to wind down where that is appropriate," he added. There was the sale of the parent company of Budweiser earlier this week and Jayski also has a report that yet another company is considering making a bid for Sprint. The question is, does NASCAR Now have the reporters to cover this type of story - or more importantly, do they have the analysts who can take a good look at the subject and explain them to viewers without telling us "hey, no problems!" like Evernham did Monday night with Budweiser? Will they even try to be objective IF they bothered to cover the subject? It's because of people and comments like this that NASCAR is currently in a lawsuit. Your opinion, in my opinion, is completely uncalled for. So basically what your saying is the only reason Danica Patrick won a race is because shes a girl and she gets more money than the guys? OH and Brad D. didnt work hard to get where he is today. Everything was handed to him since he is black? PLEASE! He has worked harder than anyone to get where he is today. You have to remember he is in a partnership. That means he was chosen over other people. He obviously is qualified for the job. 3web88, it's called entrepreneurship and is what makes America different from so many other countries. I applaud Brad for having the guts to take the risk and I hope he reaps the rewards. He seems like a super nice fellow, as does Marcos. I wish them much success in the future! BTW, I am a Junior fan and am sure that Junior nor Dale Senior would approve of your earlier comments. At first I was troubled by the conflicts-of-interest of Rusty Wallace and Ray Evernham, but I have come to believe their knowledge as current owners is far more important to me than any conflicts-of-interest. After all, NASCAR is one big product placement and, uh, a few races sprinkled in here and there. I don't mind when people involved also give opinions as long as everyone understands the situation and can judge each comment on it's own merit. What I don't like is when someone is affiliated with a company and wears their name on their shirt, but never discloses the affiliation or prefaces controversial comments that state that affiliation. Brad, Rusty, and Ray are all up front with the connections so I have absolutely no problem with them. After watching Rusty's clumsy attemtps to deal with Steven Wallace's weekly crashes--and his inability to assign blame to Steven--I have to disagree. After watching Brad's comments on Wednesday's NASCAR Now about whether or not Toyota needs to get slowed down in the engine department, I was struck by how differently I heard his words. Does it surprise you that Rusty might be a proud father and therefore lack objectivity? I see it and discard that portion of his comments. I'd rather hear what he and Evernham have to say about how teams work and the off-the-track problems that teams have. You can throw the proud father off your screen, or as some here do, throw out the adulterer and everything he says, but then you lose the value that ESPN sought when they hired him. I think we might agree that the powers that be at ESPN are not naîfs, so they must believe the value they get from Rusty, Ray, and now Brad outweighs any possible credibility gaps. Like JD commented with Brad I have a problem when Rusty the team owner goes on about the Toyota engines and Nascar needs to fix it, I have no problem when Rusty the car owner doesn't want to throw his driver under the bus, I especially am OK with this since his son is the driver. Would you really want to watch a man critcize his son on TV, he has said at time that Steven made a mistake but usually he is silent and lets the others in the booth do the talking. Now Brad is going on about Toyota power. You don't hear Larry Mac saying they should change things mid season do you. I don't recall Ray saying that either. I wonder if Rusty didn't have such a big platform; which now Brad will also have; Nascar would have reacted at all. They didn't FIX chevy last year when they were winning everything did they. As long as the potential conflict is disclosed, then I can decide whether or not I want to discount a commentator's position. In fact, I believe potential conflicts are disclosed more in the racing and TV racing arena than in almost all other sports - and by other parts of the media. I am a big Bill Cowher fan, but I know he will not be wearing a sign "Coach for Hire" on CBS this fall - but he might be available. As far as I know the Charlotte Observer, for which David Poole writes, does not disclose how much advertising revenue it receives from SMI and from the huge auto dealer network controlled by Bruton Smith. If Jeff Hammonds shows up on a SPEED show with a corp. logo on his shirt, like Toyota, then I am alerted to their being a potential conflict. I would rather hear Rusty, Ray E., or Brad D. and take the potential conflict into account than not hear them. My first race was a Busch Series race at Hickory where Spencer punted Jarrett at the end. Late 80's. Brad had financed Robert Pressley fledgling entry into this BGN race. I was 6 rows from the fence when RP was pushed into the wall and sprayed us with debris about midway of the event. I say hurray for Brad. How does that relate to Randy Moss? Some of you people have too much red in your koolaid. I speak as a southern redneck, so I say what Brad gets, he's earned through his involvement in the sport since his debut at that time. It has been well documented in stories both in print before the dawn of the internet and in subsequent stories since the birth of the interwebbietubies the connection Brad has with NASCAR and any allegation that Brad has no credibility as a NASCAR owner is simply disengenious. I could rant all day but you goobers will never see the light of day. JD, you can delete this post, as well you should but it has been good to get this off the big ole hairy chest. I don't think the real issue here is his credibility. That was just Andy Petree's response to a question on NASCAR Now. My issue is what happens when Brad or Ray or Rusty is put on the spot during The Chase with an issue like Toyota being docked because they make too much power? The entire idea of having a commentator is someone who can say what is on their mind. Between Michael and Darrell, Rusty and Ray and now Brad I think it has put their opinions in a very different light whether that is deserved or not. Michael is doing the Trucks and Rusty the Nationwide Series, but Brad and sometimes Ray are going to be high-profile on ESPN and ABC with the Cup stuff. As I said, it should be interesting. Does it surprise you that Rusty might be a proud father and therefore lack objectivity? That is exactly why he does not belong on a professionl, national-level sports broadcast, calling races involving his son.